The soft yellow floating rubber duck is actually an American icon that was invented in the USA in the 1800’s before the whole industry went overseas. We are proud to have returned the manufacturing of rubber ducks back to America to be the only ones still making them here once again! 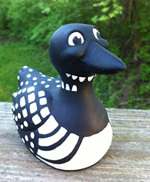 At our factory in Michigan we are making our Good Ducks, the safest PVC Free rubber ducks on the market. They are considered the safest rubber ducks in the world for babies to teethe on! CelebriDucks creates extraordinary specialty items for many well known American companies including: Harley Davidson, Marquis Spas, United Way, Sterling Health, Dixie Ducks and more. Our custom promotional premium advertising items and custom specialty designs are unique in that they reflect a quality in terms of design, sculpting and painting that is unequaled. They are manufactured to float perfectly upright and never let in any water. Please visit the Made in America section on our website to read more and watch a video that HGTV’s Home Factory shot in our New York factory showing our ducks being made. CelebriDucks are not only considered the finest rubber ducks on the market, but we are also the top custom duck manufacturer in the world. CelebriDucks rubber ducks also make a fantastic item for fundraising. You can use any rubber duck or other fun animals we have in stock or we can design a specific custom item just for your event. They are a great way to raise funds for schools, teams, non-profits, etc, and make an exceptional collectible which people love to own. 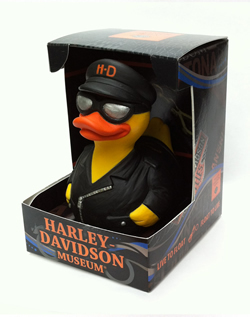 One of the most iconic brands in America asked us to create a Harley-Davidson rubber duck. He comes in a gorgeous gift box showcasing their graphics and the tag line, “Float to Live, Live to Float!” They also wanted to know if we could make it 100% in the USA which we did! Thanks to Harley’s tremendous patience and support, we created this awesome collectible for The Harley-Davidson Museum. Marquis Spas and Hot Tubs came to us to create a mascot for their company using a rubber duck, or loon as the case may be, 100% made in America!! 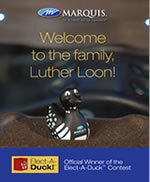 So here he is, Luther Loon. It really makes sense since Marquis makes all their products 100% in the USA! It is such an honor to work with them. The soft traditional yellow rubber duck was actually invented in America and until now, they were all made overseas. We brought the rubber duck industry back to the USA and are now the only ones making them here once again. The Future Farmers of America were the first ones to have them made here again and you can get one of these limited first editions by going to their website by clicking here. 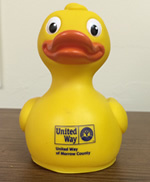 United Way of Morrow County in Ohio stepped forward to do the first ever traditional yellow duck race with 100% Made in America rubber ducks. This United Way chapter was totally committed to supporting American jobs and industry and it was a huge success. You can watch us making their ducks in the video clip on the top of the Made in America section on our website that HGTV filmed at our factory! Sterling Health & Wellness had us create Darcy, their new mascot, to encourage supporting things made in America as part of their Healthy Living Initiative. After searching extensively to find a healthy, happy duckie to complement their Sweet Lullaby collection of bath products, they found CelebriDucks. Watch the clip HGTV filmed of them being made at our factory in N.Y. at the top of the Made in America section on our website. Sterling Health Boutique’s lotions, bath products, and candles are artisan crafted, small batch luxuries created with quality standards and hand poured with joy in Huntsville, Alabama.Visit Sterling Health website by clicking here. While bringing the rubber duck industry back to America, the State University of New York contacted us about doing a loon for the first ever duck race in American history using American made ducks (or loons as the case may be). And so on Memorial Day 2012, the big event happened! They are also being used as a great item to raise money for their forestry programs! This is such a great story. Ducks on the Pond came to us to create a duck 100% made in America to celebrate baseball and rubber ducks, both of which originated in the USA!! 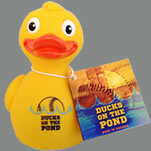 Ducks on the Pond is an expression going back to the 1940s to mean players on base waiting to score. The company is located in Detroit and they even gave one to Jim Leyland, the Detroit Tiger’s manager, in addition to the team’s owner and management. You can actually buy one by visiting their website by clicking here. UltraCarz is an American company creating cutting edge technology to increase gas mileage in any kind of vehicle. They are really trying to make a difference in helping the environment and also by supporting American jobs. 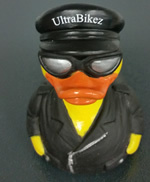 So when they wanted a promotional item to sell and give to clients, they came to us to create the Ultra Carz biker duck 100% in the USA! 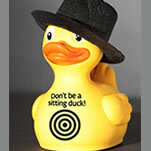 ESET North America came to us because they wanted a very cute looking duck to put a hat on for an upcoming trade show. This is an 800 person company with offices worldwide who discovered one of the first ever computer viruses and went on to create one of the fastest and most effective antivirus programs in the world! They needed hundreds of these ducks to give away. Their duck was 100% made in America and we even helped them find real little hats to go on their heads. You can visit Eset website by clicking here. 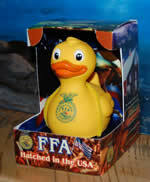 Dixie Duckies only uses our 100% made in America rubber ducks for their line of fun themed rubber ducks. 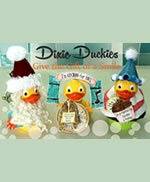 Each Dixie Duckie then travels to a groovy mid-century modern house located smack dab in the heart of Dixie where he is “accouterment-ized” with an outfit and handmade tags customized with your greeting. He is then sent on his way with the noble and heart-felt mission of delivering smiles to someone you care about. Now that’s a Duckie-worthy mission! To check them out at their website click here.